Maybelline has been coming out with a lot of new products lately. This is likely due to the holographic trend that is all over the runways right now. 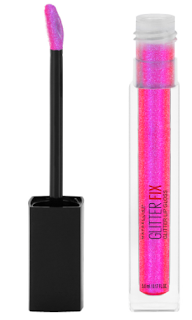 One of the really cool products that I love that Maybelline has come out with is their Glitter Fix Lip Gloss. It comes in six shades and is so beautiful on the lips. The shades are: Gold Boost, Pink Smoke, Shadow Hunter, Spell Struck, Steamy Nights and Wicked Tease. I tried the first three shades: Gold Boost, Pink Smoke and Shadow Hunter. These are regular holographic lip glosses with microfine glitter in them to give them a dramatic and lustrous effect. Maybelline's attention-grabbing lip glosses deliver a remarkably lightweight, glitter finish that can be worn alone or paired with your favorite color to intensify the look. Maybelline's Glitter Fix Lip Gloss is available in a range of shimmering shades from pink and bronze to blue and purple. I love this lip gloss. It is very pigmented and long wearing. That of course means that it is slightly sticky, but that is okay. It isn't that sticky. And the glitter is microfine, so you don't even feel it. But it looks gorgeous on the lips. Especially with any other color on. I really like the new products that Maybelline has come out with and especially the holographic/glittery products that make you look like you just stepped out of the future. Those are my favorite products. I have a feeling you will love these too. I hope these become a permanent addition with more colors. 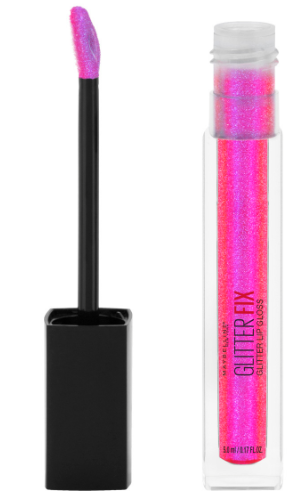 Maybelline Glitter Fix Lip Gloss retails for $8.99 and is available anywhere that Maybelline is sold, such as mass market retailer and Ulta Beauty. Like Maybelline on Facebook: https://www.facebook.com/maybelline; Follow Maybelline on Twitter: @Maybelline; Follow Maybelline on Pinterest:http://www.pinterest.com/Maybelline/; Follow Maybelline on Instagram:http://instagram.com/maybelline# and Follow Maybelline on Tumblr:http://maybelline.tumblr.com/.